This story falls under the What Are the Odds? category. In this case, they were not in my favor. And I got busted. My intentions were good. I had taken over a manufacturing company and was trying to save it from $1 million loss on one order. This company had one large client, responsible for 60 percent of its revenue. A discount mart, it provided the company with steady work and allowed it to grow significantly. The discount mart even asked this company to change manufacturing capabilities to suit its needs, and because it was such a large customer, the company invested millions in upgrades so it could print T-shirts in several different ways for the discount mart. The investment seemed to be paying off. However, there was no written contract between the parties. Until one day. The company had produced $1 million worth of branded/licensed T-shirts, just for this discount mart. Just prior to shipping the large order, the discount mart said, “No thanks.” That’s when the CEO knew he had a crisis, was reviewing his bankruptcy option and sought my help. I told him it was a good thing he still had the merchandise and could do something with the T-shirts to cut his losses as there was no written contract he would be violating. But the discount mart wouldn’t have it. It was like an old lover. They don’t want you anymore, but they don’t want anyone else to have you either. If we did anything with those T-shirts, they’d say adios forever. I figured we could still sell them in markets where this discount mart doesn’t compete, so we’d at least get 50 cents on the dollar. The strategy worked and we found a market in South America willing to buy the shirts for enough money to cover our costs and avoid a bankruptcy filing. Everything would have been fine, except for one thing. The son of one of the discount mart executives vacationed in South America and bought dear old dad a souvenir T-shirt. You guessed it – one of those T-shirts. The discount mart made good on its threat and severed the relationship. I was able to keep the company out of a bankruptcy and the company sold six months later at a significantly reduced price. The lesson here is about more than T-shirts, however. It’s about never becoming too reliant on a single customer, vendor or product – what I call the Big Gorilla. My rule is if a customer, vendor or product involves 25 percent or more of some part of your business, you’re dealing with the risks of a Big Gorilla…. sooner or later. So far we’ve had three New Years’ Resolutions for your business, and each of them has been tailored very specifically towards the way you think about and approach your business. Now I want you to take the time to analyze not just your business, but also your business environment. As a turnaround professional, I know how fast things can change in business. A new competitor can enter the marketplace, seizing a large percentage of your market share in a matter of weeks or months. By undercutting prices, getting better arrangements with vendors, capturing a few large clients/customers or offering something you’re not, competitors can be ferocious. Rather than live in fear, however, there are some steps you can take to minimize the impact of competitors on your business, at least as a surprise. First, if your business relies too heavily on a “Big Gorilla,” (that is, a single customer or client), make sure that you either diversify, determine what you can do absolutely best for this customer/client and do it, or ensure that there are legal reasons this customer/client is bound to you. In addition, don’t compromise on routine competitive research to regularly evaluate the marketplace and business landscape. Consider having a full time employee whose job it is to research the products you offer, who else offers them, at what prices and with what conditions, what vendors they use, where they’re located, what their growth looks like and more. If you use the Internet to do a lot of business, consider the tool Spy Fu. You must know your competition, and you must know them well. Consistently investigate your competition and what your competitors are doing. You never know when a flailing business will be ready to be bought out by a ready and poised you. But you’ll never know if you aren’t researching the competition. As you plan for the New Year, consider what a great time it is to take a look at your competition in order to incorporate any new information into your planning and self-evaluations. Monitoring your competition isn’t the only thing you should do to watch your business environment. If you’re in an industry subject to regulation, keep your eyes out for any new legislation as the clock tics towards 2012. What are you doing to stay apprised of your business environment? In 2007, a large Southeast-based contractor called us at GGG for the usual reason: they were having a crisis. This call marked the beginning of an 18-month turnaround, during which the company regained its financial health to continue operating profitably. For decades prior to 2007, business was booming. After many years of profitability, and coinciding with the broader economic decline in the USA, unprofitable long-term contracts with major customers resulted in severe declines in cash flow and ultimately the business overall. Its unsustainable position also put the operations of the utility company’s customers in jeopardy. Anxious about these alarming trends, the bank cut back on the company’s availability (they decreased the amount the company could borrow against their receivables), shrinking the cash available to operate. When we arrived, we were asked to act as advisors to find new financing opportunities, to streamline operations and to act as interim CFO. Besides the unprofitable contracts and unfavorable cost structure, the company was operating in a saturated and highly competitive market. It therefore had limited ability to raise prices despite improved operations. Banks, naturally, like to rely on numbers rather than hopes and promises. Thus, in order for any troubled company to get financing, the company needed to be fixed first. When it was clear to the bank through facts and data that the company has regained its stability and had long-term growth potential, the bank was more likely to provide additional funding. First thing was first – and I recommend this for you and your business – we renegotiated contracts that were generating losses and reengineered the cost structure to accommodate prevailing economic conditions. We worked with the company leadership to eliminate unprofitable product lines, renegotiated vendor debt, and executed on a forbearance agreement with the senior lender. We also solidified a long-term contract with a key customer. You should always have controls to monitor your product lines, so as to avoid losing money (or too much money) in the first place. Don’t assume because something worked once it will continue to work. One of our largest vendors (Big Gorilla) was paying every 90 days which was creating huge cash-flow problems. Implementing tighter credit criteria was a must. Consider your credit risk based on who you offer terms to and consider overhauling your system and reducing your risk. We introduced the requirement of collaterals or guarantees when necessary and shortened payment terms for the company’s customers across the board. Though most of our efforts with the company were geared towards creating cash flow, each of the above actions was necessary to ensure the company’s survival. Despite the turnaround success and the awards and accolades GGG received for it, there were some expected difficulties. We had to lay off some people, remembering that despite being a tough thing to do, letting some workers go saved the jobs of many others. As a result of our efforts, the company shifted from a significant loss to positive cash flow after 16 months. The bank debt was significantly reduced, and a new two-year bank loan was executed. Due to the speed of the turnaround, the bank elected to extend the company’s credit. An important factor in the bank’s continued partnership was that we educated our banker about our turnaround efforts and successes. The bank was happy to maintain a client when it could see the signs of a positive transformation and have open lines of communication. Always make sure you communicate with your bank by following The CEO’s 10 C’s of Borrowing. Currently the company has an excellent relationship with the bank that includes ongoing and honest communication. In fact, the company completed an acquisition in 2011 and its employees received raises across the board. This case reinforced for me that 95% of any turnaround is not about specific knowledge regarding any particular widget or industry. GGG had a lot of construction experience by this time, but only about 5% of the turnaround had to do with construction company issues. The rest had to do with basic blocking and tackling issues: watch your contracts, watch your cost, watch your headcount, negotiate with the bank. You can hardly learn these important business lessons from a textbook – you learn them from getting the bloody noses that my partners and I got throughout our decades of experience. How can we learn from this case? When your numbers start getting soft or you start losing money, be proactive. If the company is highly leveraged, has a decreasing cash cushion and is maxed out on its credit, these are among the signs that it’s time to take more serious action. None of us has a crystal ball to know exactly how long this current economic downturn will last. If you are seeing problems and intend to survive, restructure sooner. If you must let people go, do it in one confident move. If you have multiple layoff weeks or even months apart, you will demoralize your employees who will feel insecure in their positions. As CEO or leader, you need to be aware of the economic reality and act decisively based on them. Whatever your business, face your harsh reality and be proactive. There’s little I find as useful in business as knowing my weaknesses. This applies to me as a person just as it applies to my business, GGG, and any business that I am leading or involved in. It is in weaknesses that I find opportunities for growth or increased stability and future success. As a human being, my partner in life – my wife – makes me a better person. I know my weaknesses, and I know that with and because of her, I will grow into a stronger person. I like to flatter myself by imagining that she feels the same about me, and that many healthy, enduring and strong relationships include this dynamic. As a business leader, I find that it is best to surround myself with those who can do what I cannot. Whenever Grisanti, Galef & Goldress brings on a new associate or partner, we ensure that this person has skill sets and areas of expertise that are outside of what we already know, do and provide. In that way, our business and its services grow and evolve and we get stronger as a company. Successfully bringing on someone who fits this bill begins with understanding our weaknesses as a company. Similarly, when I am brought in to lead another company, I want to know where the weaknesses are. Considering the crisis situation a company is in when I’m brought on, no doubt the immediate weaknesses are apparent to me – as they are to others. However, it’s an analysis of everywhere else that the company is weak – and therefore vulnerable – that allows me to start shoring up those holes and preventing further and future catastrophe. For instance, if I’m brought in to manage a cash crisis, but discover that a company’s key products have not evolved in two decades and are now competing in a saturated market, that’s a weakness that needs to be addressed and is no doubt linked to the cash crisis – or will be one day. If I learn that we have a Big Gorilla as a client, then I’m going to see how that potential crisis can be mitigated early as well. It’s knowing these weaknesses that help with current problems and stave off future ones. Knowing your weaknesses allows you to address them and grow as a person, company and business leader. Face the harsh reality. Want to learn the kinds of questions you should be asking yourself to face your harsh reality and learn where your weaknesses might be? Then read my 3 Part series (Part 1, Part 2, Part 3) and find out! What are your weaknesses? How do you plan to deal with them? For the last two weeks we’ve been discussing the questions you should ask yourself to confront your business’s harsh reality. Read about Part 1 HERE and Part 2 HERE. This week, we’re going to ask ourselves the next two questions your should be asking. 5. Am I protecting the financial integrity of my company during downturns so that I am prepared to profit during better times? Bad financial times prompt too many managers to take the turtle mentality. Don’t put your head in your shell until things turn up. Take the opportunity to see what is inefficient in your business by eliminating loss leaders and reducing inventory, and increasing marketing and sales expenses in high profit-margin areas. By shoring up problem areas during a downturn, you prepare your company to run lean and mean at all times. This is not an excuse to avoid monitoring, evolving and preparing during good times, though. Many companies ride the wave of what’s working and worry about problems after the wave crashes on the shore. That’s the wrong approach. As long as you know it’s a wave, you know it will end. Come smoothly onto the shore, long since ready for the next wave. Companies that ignored this advice (not that they asked me) were satellite TV companies and Blockbuster. They both road their waves until they crashed into the shores of cable television and Netflix. Speaking of crashing, if all of your assets and capital are invested in one area, and a problem occurs, operations will grind to a halt. If you have a Big Gorilla – one client, customer or product that accounts for 25% of more of your sales – you need to rethink what you’re doing. Along these lines, don’t bet the ranch on other opportunities; remain grounded in your decision making. In our experience, Big Gorillas are one of the top five reasons companies experience crises. As above, consider the advantages of protecting your company’s financial integrity for more profitable times. There are always competitors who have issues, and if you keep cash or credit lines available then you can take advantage of someone else’s mistakes, acquiring new product lines or growing old ones. 6. Do our financial departments have sufficient controls and a fraud awareness policy? 75% of the fraud I discover is from first time offenders. That means the people who ultimately commit the fraud are not those who will come up in criminal background checks. Therefore, when working with your auditor, integrate sufficient checks and balances. As the CEO you have to have a constant feel for your business financially. Walk the company and manufacturing floors – be hands on. Don’t let your guard down by taking your tie off and lounging in your office. Stay involved. I once had a BBQ at 1 a.m. for a production crew at a company that ran 24/7. While doing this I discovered a multi-million dollar fraud. Do what would be considered out of the ordinary, and you never know what you’ll find. One thing I recommend without exception is making your CFO/Controller take a two week vacation once a year. Don’t even let him in the building. Sit at his desk, or have someone else do it, and see what happens. You’ll be surprised every time as you find duplicate expenses, continued payment on cancelled leases or sold equipment, and perhaps personnel that don’t exist. I hope these 3 posts about the 6 Questions to Ask Yourself to Confront the Harsh Reality of Your Business have been helpful. I’d love to know the answers to any of them if you care to share or questions that you would add to the list and that help you confront your harsh reality. Please share in the comments section below. Everything changes but change itself. Little rings truer to me than this statement by President Kennedy. I was speaking to a CEO group just last week and I was telling them: change is coming, change is here, change is staying. What does that mean? It means that everything changes but change itself. Conditions will never remain the same, and as a business person you have to prepared for that. Be ready for the future and be ready for change. Let me give you an example, that I like to call the Big Gorilla example. A while back I was CEO of a manufacturing company that made t-shirts and sweatshirts. We did good, steady work, and one day K-Mart came to us and started placing huge regular orders. A big change! They asked us to change our manufacturing capabilities to suit their needs. We did. Another big change that seemed worth it because they ordered so much so regularly. Then one day, after we produced a million dollars worth of merchandise branded explicitly for K-Mart, they told us not to ship their order, that they were having some financial issues. That was $1 million of merchandise! This was unwelcome change, and this is the power of the Big Gorilla. The Big Gorilla changes your customer mix; it changes your business; then it changes its relationship with you. When K-Mart told me to destroy the merchandise and that I couldn’t sell it anywhere – I just had to eat it – I was pretty perturbed. I, of course, didn’t listen, and sold the merchandise overseas at enough to break even. 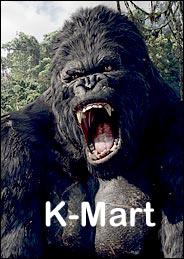 When K-Mart eventually found out (an executive was vacationing in the area and noticed the locals wearing the merchandise), the company terminated its relationship with us, changing the nature of our business again. We had lost our Big Gorilla. Two lessons come out of this story. The first is: Be Wary of the Big Gorilla. It’s nice to get a big buyer but when someone controls that much of your customer pie, change is always on the horizon. And that brings us to the second lesson: Change is the Only Constant. Believe it and prepare for it by staying aware, recognizing that all projections have holes and flawed assumptions, being proactive rather than reactive and having controls in place. What change has caught you by surprise? How do you prepare for change? Have you ever had a Big Gorilla – what happened?